You are here: Home / Giveaway / Deep Relief Heat Spray: Soothe Those Hard to Reach Aches with Targeted Pain Relief & Enter to Win a Deep Relief Prize Pack! ARV of $75. I’m reaching a very big milestone within the next few days. I am turning 30. While I know they say that 30 is the new 20 and I definitely don’t feel like I’m getting older, it has come with it’s new quirks. While it can be a mixture of many things, age comes into play, sleeping wrong and simply sitting at my desk working for hours–it’s no joke that the pains are here. Heat Spray begins to work immediately as you apply to sore aching muscles, increasing blood flow and relieving pain. Continuous spray format offers convenience when treating hard to reach areas. Lately, I’ve had a lot of pain on my shoulders and neck. 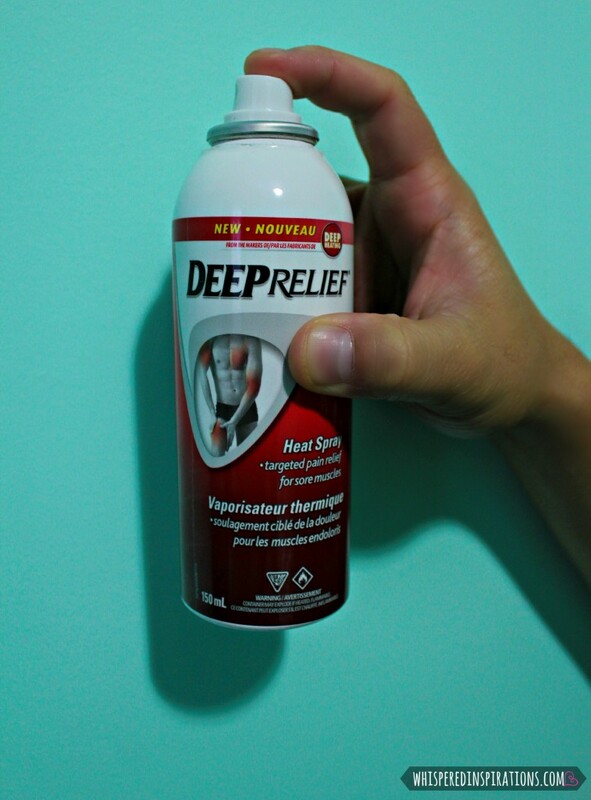 Luckily, I had the opportunity to test out Deep Relief’s Heat Spray. What I love the most is that it’s in a can! This means that I can literally spray myself and not have to wait to ask my poor Hubby to apply pain relief. While Deep Relief makes a wide array of awesome products, I absolutely love that it’s in a can! It’s the small things, right? Well, I sprayed on the Heat Spray on my shoulders and I could immediately feel the heat coming on, the sensation slowly got more intense. I sprayed both sides twice and it achieved a nice heat that helped my poor aching shoulders. The relief lasted long too and I have to admit, I love it. I also tried it on my knees that lately, too, have been getting achy. It did wonders for them and with the cold winter that has been settling in, my joints and knees are craving the relief. If you’re wondering about how it smells, it smells like menthol but, not so overpowering. I guess you can say that I am used to the smell. Menthol and pain relief isn’t just for older folks, you know? 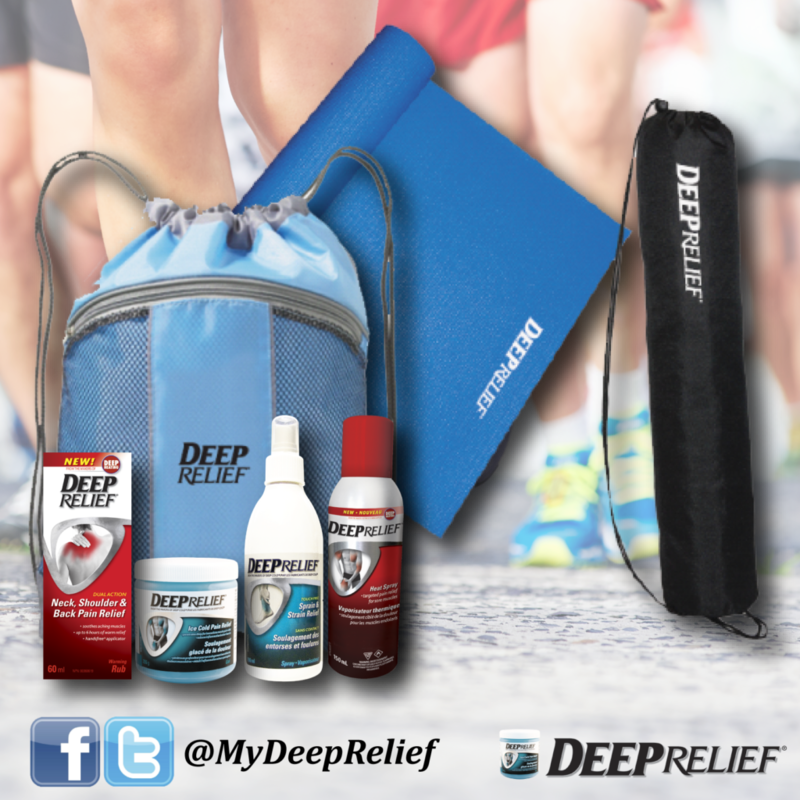 The good people over at Deep Relief is giving away a Deep Relief Prize Pack valued over $75! One lucky CANADIAN Whispered Inspirations reader will WIN! This giveaway starts on December 19th, 2013 and ends on January 10th, 2014. Be sure to check out Deep Relief over on Facebook and on their website, here. Where do you feel pain the most? Ohhh! I could sure use some Deep Relief after a hard day working on our farm!! lol I feel pain in my shoulders and lower back the most. I ache mostly in my lower back. Because of certin meds I have to take, I added 100lbs to myshort frame. Sitting down or waking up in the morning, I walk around like a really old person. I think that the: Hands Free Duel Action Neck, Shouldar and Back Pain Relief would be my best bet. oops..I guess mine got deleted. I think the Hands Free Dual Action Neck, Shouldar and Back Pain Relief would be the best for me. My back and knee. Dual Action Neck, Shoulder and back pain relief warming rub. My thumbs – I think the Ice Cold Pain Gel might be best. My lower back and I would try the deep relief spray first. I get a lot of pain and tightness in my neck and shoulders and LOVE the pain relief patches. No smell, no mess and they work! My neck and lower back are my painful zones. Hands Free Duel Action Neck, Shouldar and Back Pain Relief would be my pick. My shoulders and sometimes my back ache the most so I think the Neck, Shoulder and Back Pain Relief Warming Rub would help me. I have fibromyalgia so I have pain pretty much everywhere. I would like to try the Deep Relief spray to see if that would help. I get pain in my lower back once in a while and I think the Neck, Shoulder and Back Pain product would help. My neck and upper back. I thick the Neck, Shoulder and Back Pain product would be best! and Back Pain might help me. My lower back and I think the Deep Relief Heat Spray would help. and Back Pain Relief Warming Rub. Pain is through my neck and I would like to try the Hands Free Dual Action Neck, Shouldar and Back Pain Relief. Ice cold pain gel for my bad knee! my wrist, using my mouse too much? The Deep Relief spray would be great for my lower back pain. I think the Ultra Strength Neck,Shoulder and Back Pain Relief Patch would help me. I think their WARMING MUSCLE ACHE RELIEF ULTRA STRENGTH RUB might be good for us! would love to try neck, shoulder and back pain! my back and shoulders are always aching ! I would have achy shoulders! the Heat Spray sounds awesome! and Back Pain Relief Warming Rub would be best for us. I have lower back pain and i think the ice cold pain gel would help! My feet get so sore I think it would really help them. I have a lot of shoulder pain, and the relief spray sounds like it would help so much! Thank you! I have most pain in upper back between shoulders, so I think the Dual Action neck, Shoulder and Back pain relief (hands free) would help me the most! My back! Would love to try the heat spray! I having chronic pain in my back and shoulders so I'd love to try the Deep Relief Dual Neck, Shoulder & Back Relief as well as the Ice Cold Pain Gel for the burning muscle pain. I would love to win this for my mom. Her arm/elbow area aches a lot because her job requires her to use her hand and arms a lot. I think the Deep Relief Heat Spray would help! I think the heat spray for muscle aches would be best for me. my neck is the biggest pain 😉 dual action neck, shoulder and back pain may help! my neck- i would use the spray!